When you think of ingredients in trail mix, what comes to mind? And maybe if you’re lucky, some chocolate chips or M&Ms. Don’t get me wrong: there’s nothing wrong with traditional trail mix. But there’s nothing particularly special about it either. I recently went on a mission to make a truly unique trail mix. One that goes beyond nuts and raisins, and incorporates some unexpected ingredients in the most addictive way. I decided to experiment with a trail mix using roasted beans instead of nuts. 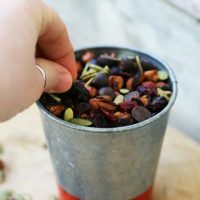 I ended up with a totally delicious and addictive snack that was – in my opinion – much tastier than traditional nut and raisin-filled trail mix. With traditional trail mix, I always find myself digging around for the chocolate. And I leave behind the overly-salted peanuts and raisins. This trail mix, on the other hand, I couldn’t stop eating. The beans, the cranberries, the chocolate – everything was delicious. Nothing was left behind. This trail mix is great for individuals with a nut allergy. It’s also great for those of you who have tried – and liked – roasted chickpeas. Take the next step and make roasted kidney beans. Make a batch of this snack mix for your next road or plane trip. Make some for your kid’s lunch. Make a big batch and keep it at your desk at work. Give some away as a fun food gift. I think you’ll love it! Want to start saving money on food? Stay in touch by following Cheap Recipe Blog on Instagram and Pinterest. And don’t forget to share this post with your budget-savvy friends! Kidney beans take longer to roast than chickpeas. Total time for the kidney beans is about 60 minutes. Total time for the chickpeas is about 50 minutes.However, I urge you to keep baking the beans beyond the suggested time if they are not completely dried out and crunchy. You do not want a moist bean in your trail mix! Preheat oven to 350F. Place chickpeas on a small cookie sheet. Place kidney beans on another small cookie sheet. Drizzle each tray of beans with 1 tablespoon of olive oil and sprinkle with salt. Stir to evenly coat. Place beans in oven. For chickpeas: Mix 1 tablespoon of olive oil with 1/2 teaspoon garlic powder and smoked paprika. Set aside. For kidney beans: Mix 1 tablespoon of olive oil with 1/2 teaspoon garlic powder and brown sugar. Set aside. After the beans have baked for 30 minutes, season them with the olive oil mixtures. Drizzle the oils on top of the beans and stir to evenly coat. Return to oven. Continue baking until beans are completely dried and crunchy. Total baking time for the chickpeas is about 45 to 50 minutes. Total cooking time for the kidney beans is about 50 to 60 minutes. Before you stop baking, make sure the beans are crunchy. You do not want mushy beans. If the beans are still soft, continue baking. Once the beans are cooked, remove from oven and cool completely. Combine dried beans with chocolate chips, dried cranberries, and pumpkin seeds. Yes you are right Kidney beans take longer to roast than chickpeas. But you did post full information about it. Thanks for this.